Josephine had tried to run once when she was twelve or thirteen. As the novel opens, she’s a seventeen-year-old house slave who tends to her mistress, an artist named Lu Anne Bell, on a Virginia plantation in 1852. Josephine’s attempted escape and the tales of the people who aided or thwarted her gird this section of the novel. In the alternate story set in 2004, Lina, a first year associate in a New York law firm, must find a face for her historic case seeking reparations for the descendants of American slaves Lina and her artist father have lived in their Brooklyn house her entire life; it’s her rock in an uncertain world. Lina’s father soon helps her discover that the famous, surviving paintings by Lu Anne Bell, portraits of slaves on her plantation, may actually have been the work of Josephine, the slave. Lina is certain that one of Josephine’s descendants would be perfect for the lawsuit so she sets off to find one. In her quest she learns about Josephine’s life in 1852 and discovers parallels with her own complicated story including that of her mother’s mysterious death when she was very young. Josephine’s story is evocative of the period and Conklin’s writing soars in her descriptions of plantation life. Her reliance on actual slave diaries is evident and she makes the characters seem real and important. She’s less successful with Lina’s life which seems almost an afterthought and that surprised me since Conklin herself was once an attorney much like Lina. The reviews of this novel are almost as divided as the issue of slavery was in 1852. Kirkus loves it and Kirkus is unrelentingly tough so when it gives a book a starred review, it means it. IndieNext made it the top pick for February. But Publishers Weekly wrote one of the most scathing condemnations I’ve read in that publication -- calling it “trite, predictable, and insensitive at its core.” This reader believes there’s truth in all their observations and reasons galore for many to love this book and for others to find it wanting. It seems to be a case of split personality, a tale of two eras, two house girls. Lina can leave her house but doesn't. Josephine wants to leave but can’t. Who’s free? Who’s enslaved? I really cared about Josephine and her quest but I didn't feel there was enough information or character development in Lina’s story. I wish the author had simply written Josephine’s story and allowed her powerful words to illuminate the horrors of slavery. Summing it Up: Read the excerpt. Decide for yourself. Enjoy learning about the life of Josephine, the artist and slave, in 1852 but don’t expect as much from Lina’s world today. Eric Carle recently posted this delightful picture on his blog. His new book, Friends, will be out this fall. Till then, find a child and reread one of your Eric Carle favorites or visit Carle's blog for pictures to brighten the dreariest February day. With some trepidation, my book club voted to discuss Catherine the Great knowing full well that its 625 pages might present a time-management challenge. Thus I was thrilled when all eleven who gathered for lunch had enjoyed the book and would recommend it to others. If it hadn’t been a snowy January day, I’d have suggested heading to a Russian restaurant in Chicago where we could have savored borscht, blintzes, tea and a Napoleon torte while pretending we were dining at the Winter Palace. Then we could have walked to the Art Institute to see paintings by Rembrandt. Rubens, Van Dyck and masterworks similar to the 4000 paintings Catherine procured for the palace and her newly created Hermitage gallery. Our discussion of Robert K. Massie’s biography might have seemed to the waiters serving us more like gossip about the Kardashians than talk of an eighteenth century monarch. We chatted about Catherine’s affairs, her jewels, her furs, her unconsummated marriage, her husband’s drinking and playacting, and the more expected subjects of her intelligence, her political savvy, her expansion of Russian borders and her tenacity. 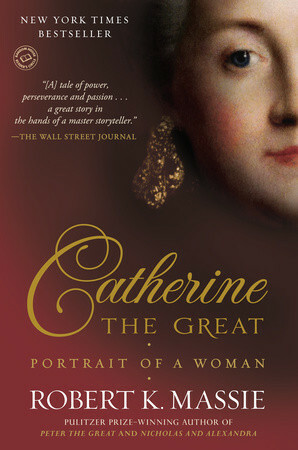 Catherine the Great, the larger-than-life Empress of Russia, began life in 1729 as Sophia, a minor German princess. Joanna, her mother, was just sixteen when Sophia was born yet her ruthless ambition superseded her age and character. When childless Empress Elizabeth began searching for a bride for her designated heir, her nephew, Peter, the only surviving son of Peter the Great, Joanna shamelessly pushed for then 14-year-old Sophia, noting her “freshness, intelligence and discreet, submissive manner. “ Sophia soon ingratiated herself into Empress Elizabeth and the Russian people’s hearts via her unstinting quest to learn everything Russian – language, culture and even the Orthodox religion to which her conversion was required. Upon that conversion, the Empress christened Sophia as Catherine and her rebirth as a Russian princess resembled a fairy tale. But, Peter, her 17-year-old husband and heir to the throne, was no knight in shining armor. Instead he was a mentally unstable adolescent who played with toy soldiers, tortured pets, favored all things German over anything Russian, and was both unwilling and physically unable to consummate their marriage. Still thwarted by Peter and remaining a virgin, Catherine began the first of a dozen affairs she was to have to bring love into her life and she at last gave birth to a son in 1754. Empress Elizabeth immediately took him from Catherine not allowing her to see him for almost a week. Catherine, depressed from being denied any role in her son’s life, turned to books for solace and read Voltaire, Montesquieu, and histories of the Roman Empire that later helped her form her enlightened approach to governance. Massie makes Catherine real to the reader by using her own copious diaries and the letters written by famous leaders of the time. He meticulously illustrates Catherine’s astute powers to gain what she wanted through her intense study of a subject before making recommendations. Catherine’s rule was larger than life. When a small pox outbreak threatened her subjects, she herself was inoculated with the new vaccine so the people would see that it was safe. When Voltaire needed cash for his daughter’s dowry, Catherine bought his entire library. Her desire for love led her to Gregory Potemkin who was ten years her junior and whom she may have married: "Their romance, their relationship, was extraordinarily passionate. Many of their letters are included in the book — "they're almost burning the page," noted author Robert K. Massie. When her inept husband ignored a conspiracy and continued his childish pursuits, Catherine mounted a white stallion and led 14,000 soldiers to arrest and unseat him. After the coup she ruled for thirty-four years packed with intrigue and the expansion of her empire. This book reminded me of Walter Cronkite’s “You Are There” television show of the 1950s that reenacted history by making the viewer feel a part of it. This biography makes the reader feel “there” at the creation of a Russian port on the Black Sea, at meetings with the great leaders of the world, and in the drawing rooms of the palaces where Catherine’s acumen accomplished seemingly impossible tasks. Lovers of historical fiction including the Philippa Gregory novels will enjoy making the leap to nonfiction as this biography proves that truth can be more exciting than fiction. Summing it Up: When the august New York Times opens its review of a biography with “How delightful to discover that Robert K. Massie, 82 years old, hasn’t lost his mojo.” you know you’re in for something special and this book is more than special, it’s a masterpiece. This biography will make you feel that you’ve floated across the snow in a fleet of sleighs heading south toward the Black Sea. It will feed you with savory facts about the French Revolution, the changing boundaries of Eastern Europe and court life during the 1700s. I challenge you to read it and to beg your book club to discuss it.